God’s codes of Light open to heaven our sight. Ignite to remember God’s Divine covenant and give. In the painting of Moses, the Fire of truth and transformation burn eternally reflecting Heavens Etheric Codes of Light. His piercing eyes of truth, remind you to follow your Souls Purpose and trust not in mans law but in God’s Universal Law. 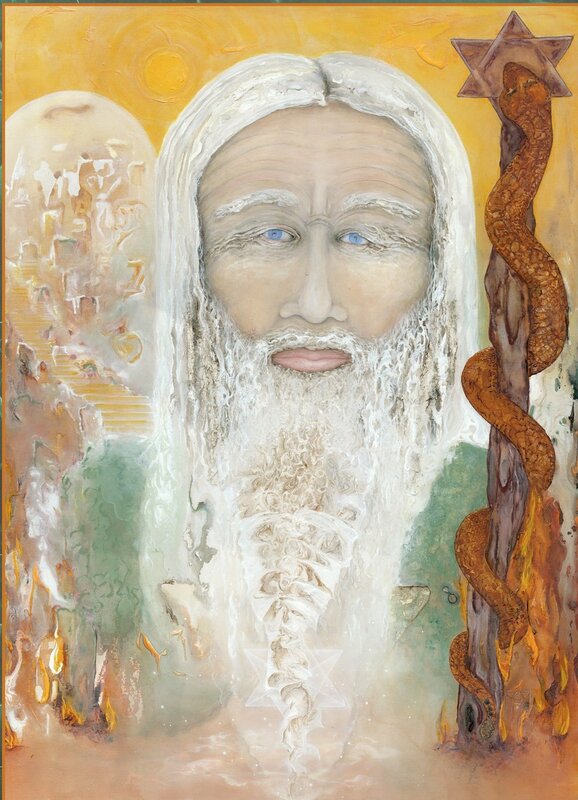 His staff dons the serpent signifying Moses as a messenger of God with the power to command miracles, awaken and transmute venomous beliefs of darkness into Light. Behold when you gaze upon the brazen serpent you shall live. Moses quested for 40 years in the desert. In the silence of his heart he found God dwelling there. Led through many dreams and visions, he then took God’s command and set forth to free the Jews of slavery and rekindle the flame of belief and faith in the Lord, fulfilling his Souls Purpose. With the power of God, Moses then commanded miracle after miracle to convince the Egyptians, who did not recognize God's complete mastery and for the Jews who were lost, to remember their Soul’s Purpose. Know thyself. To live congruently with your Soul’s Purpose and embody this intelligence directly requires self-inquiry. Trust the process. Relinquish control and surrender to the divinely orchestrated cosmic plan. Choose to live as an example in harmony and wholeness with your souls highest purpose. This choice opens doors. As you allow this emergence you consciously return home to the Love in your heart. Moses invites you to surrender consciously in Spirit to Gods infinite Light. Saying yes to this prompting of your Soul’s Purpose is love’s divine Fire. From your most sacred inner self, consciously unite with the power and majestic truth of Heavens Etheric language of Light. Remember. Command the Red Seas to part and your Soul’s Purpose to rise up before you. Take your creation beyond where it has been before.